Corpus Christi Miller fans still remember the 1960 season, when Johnny Roland guided the Buccaneers to a 13-1 record and the Class 4A state championship. Bucking the perception that South Texas didn’t produce big-time recruits, Roland signed with Missouri and made an instant impact, running for 171 yards and three touchdowns in his first college game. Called the most intelligent player he ever coached by Missouri coach Dan Devine, Roland eventually evolved into a two-way star at running back and defensive back for the Tigers, earning three-time all-Big Eight honors and consensus all-American recognition as a senior. Roland was the first black athlete to serve as a team captain on any Missouri team and his No. 23 jersey was later retired by the school. 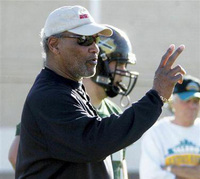 The 2005 College Football Hall of Fame inductee played eight seasons in the NFL before entering the coaching ranks. He coached 23 years with seven different NFL teams.